Increase volume level and clarity! If you want to make the most dramatic change possible to the audio power and music quality from your speakers, then replace those weak stock units with a set of our high-performance models. 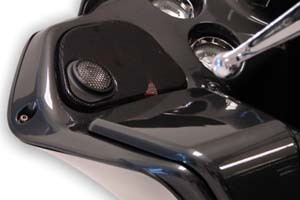 They have been designed specifically for the Electra Glide, Street Glide and Road Glide. 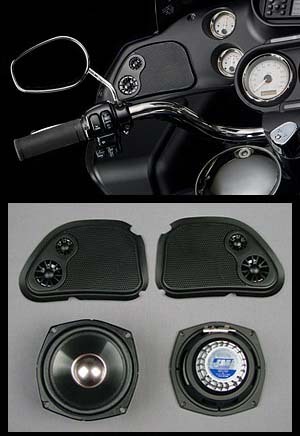 HCRK-6652TW: The MOST POWERFUL speaker available for your Harley Bagger audio system !! 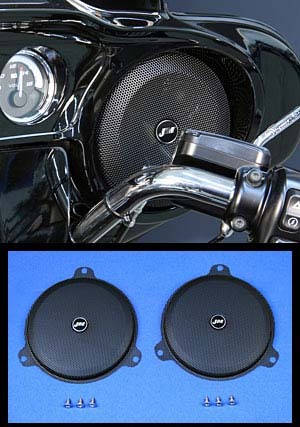 NEW ROKKER series 6.65" speakers have been designed as exact size component/replacements for the stock 6.5" Harley fairing speakers as installed on the 2014 Harley StreetGlide or Ultra. Spec’d at 2 ohms impedance and an impressive 217 watts maximum input (156w RMS continuous - 92db sensitivity), these speakers provide the ultimate in raw audio power and include the silk-dome tweeter bridge as part of this custom design. 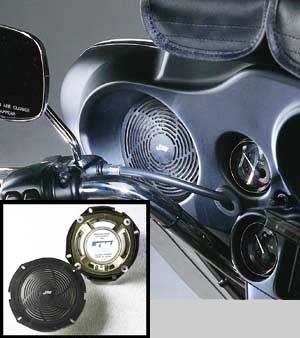 These are THE most powerful speakers you can buy for your Harley and they will perform extremely well when used with a medium to high-powered accessory amplifier. Lightweight waterproof one-piece woven-fiber driver cone. Super high-density lite-weight Neodymium magnet structure, specially coated to maintain flux-strength integrity even at extreme operating temperatures. High efficiency VENTED voice-coil & magnet structure for improved cooling when operating at high volume levels for extended periods. 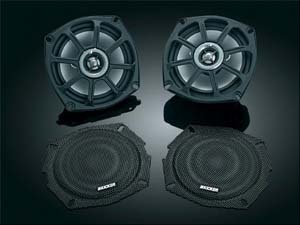 Custom max-flow speaker grills for crystal clear sound at highway speeds. Mounting hole pattern and spade electrical connections are exactly the same as the factory specification, this is a total plug-and-play no-modification solution complete with easy to follow installation instructions. 875: Never before has a replacement speaker sounded this good. We don’t simply use car audio speakers with a new sticker and call them bike speakers, these are the real deal, and once you put them in you will be blown away. 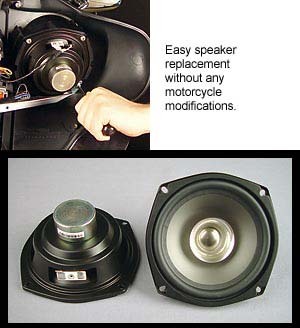 The guys over at Kicker have put a ton of time and effort into building the perfect drop in speaker for your 06 and newer Harley Touring bike. There is so much science and technology behind these that the competition is still stuck in the dark ages with the same old heavy and dull sounding speakers. Fits: ’06-’13 Electra Glides, Road Glides, Street Glides & Trikes (except '11-'12 FLHXSE, '11 FLTRUSE, & '12-'13 FLTRXSE) Dim: 5.25" inches Special order item. 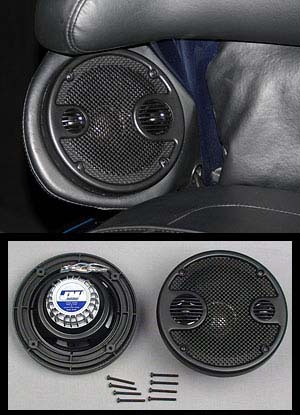 874: 4 ohm Speakers similar to above, but for MY '96 to '05. Special order item. 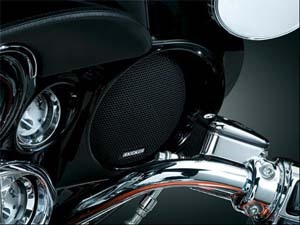 HURK-6652TW: The MOST POWERFUL speaker available for your Harley Bagger audio system! NEW ROKKER series 6.65" speakers have been designed as exact size component/replacements for the stock 6.5" Harley rear trunk-pod speakers as installed on the 2014 Harley Ultra or Ultra Ltd. Spec’d at 2 ohms impedance and an impressive 217 watts maximum input (156w RMS continuous - 92db sensitivity), these speakers provide the ultimate in raw audio power and include the silk-dome tweeter bridge as part of this custom design. 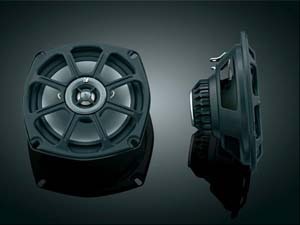 These are THE most powerful speakers you can buy for your Harley and they will perform extremely well when used with a medium to high-powered accessory amplifier. HSUK-5252: They have been designed specifically for the fairing and/or rear pod position on all 2006-2013 Harley® Ultra, StreetGlide, ElectraGlide or RoadGlide. They feature a very thin, hard, injection molded polycarbonate cone, titanium colored dust cover, super flexible rolled edge, high-sensitivity voice coil and light-weight high-flux strength Neodymium magnet structure, to provide for maximum air movement. Spec’d at 2 ohms impedance and 140+ watts power, you will be impressed by the significant improvement in bass response, midrange clarity, audio power and overall fidelity. Their overall size, shape, mounting hole pattern and spade electrical connections are exactly the same as the factory specification, making replacement a snap. Sold in pairs. HSUK-5258F,R: They have been designed specifically for the fairing and/or rear pod position on all 1998-2005 Harley® Ultra, ElectraGlide or RoadGlide. They feature a very thin, hard, injection molded polycarbonate cone, titanium colored dust cover, super flexible rolled edge, high-sensitivity voice coil and light-weight high-flux strength Neodymium magnet structure, to provide for maximum air movement. Spec’d at 8 ohms impedance and 140+ watts power, you will be impressed by the significant improvement in bass response, midrange clarity, audio power and overall fidelity. Their overall size, shape, mounting hole pattern and spade electrical connections are exactly the same as the factory specification, making replacement a snap. Sold in pairs. 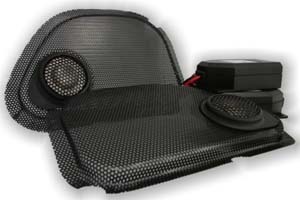 HURE-5252GTM: This new three-way high-performance speaker set has been designed specifically for the rear pod position on the 2006-2013 Harley® Ultra. Spec’d at 2 ohms impedance and 120+ watts max power, these new speakers provide superior bass response, along with an extended mid/high frequency range. They feature a waterproof injection-molded polycarbonate woofer cone, high-flux strength but light-weight Neodymium magnet, high efficiency voice coil, and the latest design grillwork with mounted tweeter and midrange drivers. Their mounting hole pattern and spade electrical connections are exactly the same as the factory specification, this is a total plug-and-play solution complete with easy to follow installation instructions. 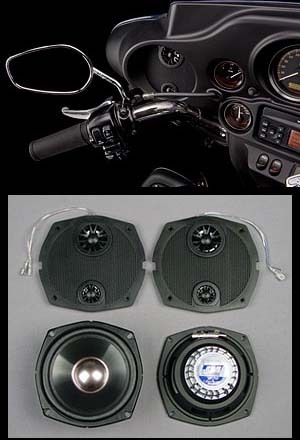 These are THE most efficient speakers you can buy for your Harley and they will perform extremely well with the stock Harley HK radio system. You won’t be disappointed. HCFS-96: If you want to make the most dramatic change possible to the volume level and clarity of the music from your fairing-mounted speakers, then replace those weak stock units with a set of our new, large diameter models. They have been designed specifically for the 1996-1997 ElectraGlide/Ultra fairing, with custom mounting/grill-set included. Rated at 3-4 ohms impedance and 100 watts power, they feature a very thin, hard, injection molded polycarbonate cone, titanium colored dust cover, and super flexible rolled edge, to provide for maximum air movement, along with superior bass and midrange response. Their mounting hole pattern is the same as the factory specification making replacement a snap. HCFS-96A: These speakers are direct replacements for stock speakers and use the same electrical connections as stock, making installation a snap! These speakers are conservatively rated and feature a 20 year warranty. Fitment Guide: 4ohm 5.25" 50 watt front speakers for 1996-2005 bikes with stock radios and 1998-2013 bikes with aftermarket radios. FLHTP and FLHT without factory speakers must use the adapter kit. BKT-476: 4" Water resistant design 10-75 watts recommended power. Lifetime OEM Warranty. RG-5254: Sharing the same high performance tweeter and crossover setup as our GTK150 and STK100 kits, these Road Glide grills offer superb performance and looks that directly replace your stock grills with no modifications. Did we mention they look good too? 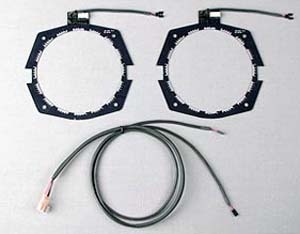 Kit Includes: 2 Tweeter Grills, 2 Crossover Modules, 1 Installation Kit. Specs: 12 db/octave Crossover, 50 Watts RMS, 100 Watts Peak (Rated - 50 Watts), Sensitivity, SPL: 93dB +/-2dB / 1W @ 1M, Magnet, 28mm x 8.5mm NEO. HGRL-BW: New fairing speaker grills have been designed specifically for the 2014-2018 Harley Davidson StreetGlide, Ultra or Ultra ltd. This new kit includes one left side and one right side grill along with all necessary mounting hardware. 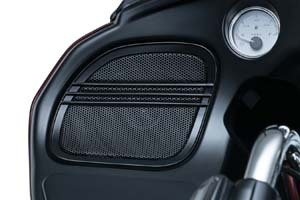 These new grills are also a direct substitute or replacement for Harley OEM parts. 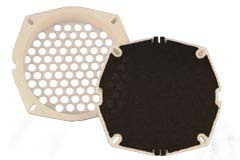 HCRG-GTMC: This is a replacement fairing speaker grill-set ONLY with chrome tweeter and midrange drivers built into the grill for use with GT performance speaker upgrades on all 1998 to 2013 Harley Ultra/Street/ElectraGlide fairings. 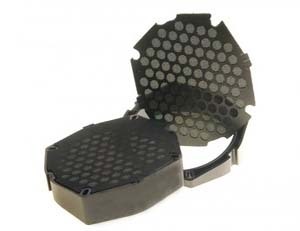 HCRG-GTMB: Same as above with Black tweeter and midrange. 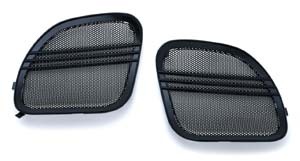 HRRG-GTMC: This is a replacement fairing speaker grill-set ONLY with black tweeter and midrange drivers built into the grill for use with speaker upgrades on all 1998 to 2012 Harley RoadGlide fairings. HRRG-GTMB: Same as above with Black tweeter adn midrange. HD-86: MY '95 and earlier right, front or rear speaker grill. HD-84: MY '95 and earlier left, front or rear speaker grill. 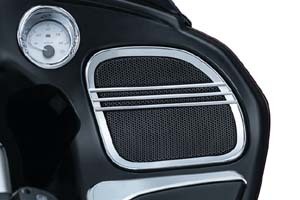 BT-105P & BT-105B: Press molded into the same shape as the stock cloth grill covers, these Power Grills open up the audio path between your speakers and your ears, and add that "aftermarket" look to your fairing. And like all our speaker products, they're sold in pairs. Polished stainless steel or black powder-coat. 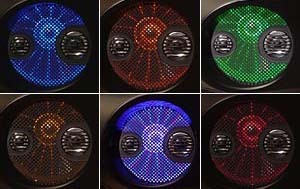 LLR-50: Give your Harley fairing dash panel the ultimate custom look with new multicolored fairing speaker LED light rings. 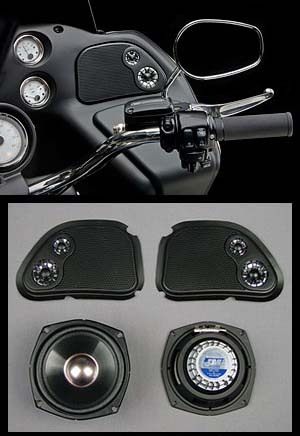 They have been designed to be used with the above GT Series speakers with grill mounted midrange and/or tweeter, on the 1998-2010 Harley® Street Glide, Ultra, Road Glide & Electra Glide fairing. These LED light rings are made with top-quality high-intensity LEDs, mounted on high-strength PCB board material, with total reverse-polarity/over-voltage protection as part of their design and are completely sealed for absolute moisture resistance to provide many years of service. Featured LED colors are Red, Blue, Green, Orange, and Amber and they are controlled by individual PCB mounted DIP switches to allow you to turn on one color at a time or a combination of colors, to help match to the color of your dash mounted gauges and/or radio lights. Installation is a snap as these LED light rings simply sandwich between the GT Series speaker grill and the plastic adapter/spacer ring that the speaker mounts to, during installation. The LED light ring power/ground wiring harness is made to plug into the back of the cigarette lighter socket, for a simple and easy plug-n-play installation. Kit includes 2 LED light rings, power/ground wiring harness and complete installation/operation instructions. 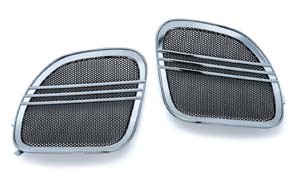 KW-97: Front Grills cover that factory cloth with these mesh cut aluminum speaker grille covers to dress up your inner fairing, or rear speakers. 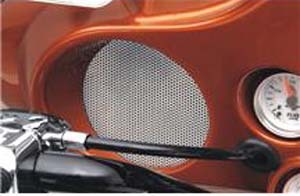 Mesh cut aluminum speaker grille covers install using your stock hardware, and are a great addition, placed directly over the factory cloth. Sold in pairs. Made in the USA. Fits '96 - '13 FLHTC, FLHX and H-D Trike Models. 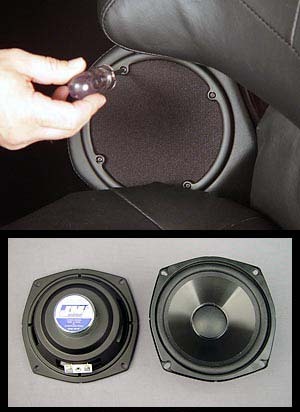 KW-51: Similar to above but for rear speakers. Fits '99 - '13 FLHTCUI, FLHTCUTG models. 7378: Replace the stock black honeycomb-shaped covers with sleek, understated styling. These Speaker Grills feature a clean outer frame with a satin black aluminum mesh screen that offers a drastic improvement in appearance versus stock plastic. Compatible with Harley's standard and Boom! 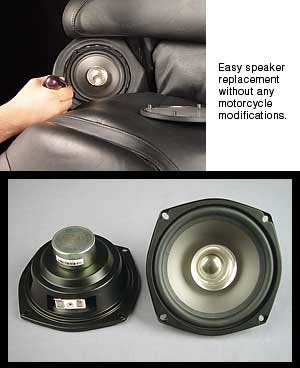 Audio Stage 1 Speakers, simply pop out the old and snap in the new for a complete custom overhaul. Chrome. Fits '15 - current Road Glides. 7379: Similar to above but in gloss black.